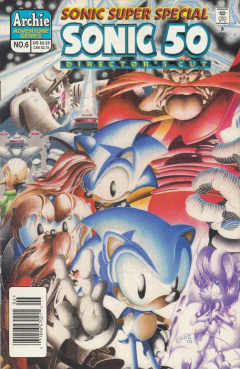 Sonic Super Special 6 is the 6th issue of the Sonic Super Special Comics. It is an updated version of STH #50. This issue concludes the First Robotnik War, with the Freedom Fighters triumphing over Robotnik. This comic features one story: "The Big Goodbye!". 1 Endgame, Part 4 - The Big Goodbye! Endgame, Part 4 - The Big Goodbye! In a flashback from many years prior, Julian Kintobor dashes through a forest, quite tired, running away from two others on floating vehicles, firing lasers at him. He trips over some foliage, causing the two beings to fly right past him. Thinking he's run ahead, they continue on through the forest, while Julian remains head-first in a pile of mud. Not long afterwards, two hedgehogs, Jules Hedgehog and Uncle Chuck, come upon the unconscious Julian, surprised that the Overlanders would turn on one of their own. Although they question helping an Overlander for what their species has done, they believe Julian to be different. They get his face out of the mud, then carry him to their motorcycle. They then ride off back to their home, though with a nasty feeling about what they are bringing back. ...all of these memories are a part of a dream Robotnik is having, in his sleep chamber. The SWATbots monitoring him note that he must be having an exciting dream, but know that they need to wake him up to so they do. Robotnik wakes up and do what he needs to do, annihilate a Overlander as a test for the ultimate annihilator. On the Floating Island, Knuckles, Geoffrey St. John and Sonic face off, with Dulcy knocked out aside. Sonic calls out to Knuckles to help him clean his name as he was framed, while Geoffrey orders Knuckles to help arrest Sonic for murdering Sally. Once Knuckles hears this, he doesn't think twice, launching himself at Sonic to take him down. Their fight proves to be a problem for Geoffrey, as he can't get a clear shot at Sonic with his bow. His men eventually catch up with their Tasmanian Devils, so he orders them to let them loose. Sonic lands beside a tree, taunting Knuckles, but a voice from the tree startles him. Espio appears, having cloaked on the tree, grabbing Sonic's arms and keeping him still. With Sonic helpless, Geoffrey and his men move in, but Knuckles, being the Guardian of the island, tells Geoffrey that he gives the orders, while Espio agrees. ...which is now being enslaved by Robotnik and his combots. They line the Mobians of the village, threatening them with roboticization, while Rotor and Tails, who have escaped, locate a hidden hatch leading to the Sea Fox and the Bathysphere, allowing them to locate other Freedom Fighter sects to help them out. While climbing down the hatch, Tails can't believe that Robotnik found Knothole, but Rotor isn't surprised with all the events that have occurred recently, but is just glad that Robotnik isn't aware of the water caverns. As they arrive in the cavern, they notice their vehicles have been scuttled. They then turn aside, where they see numerous combots, and Drago, declaring them prisoners of Robotnik. Meanwhile, at Downunda's prison after the reuniting with the rest of the Downunda Freedom Fighter they use a cargo ship to escape. Meanwhile, Robotnik, who has returned to Robotropolis, tries to contact Crocbot in Downunda. Crocbot eventually answers, dealing with an uprising with his prisoners, but they have mined some mineral ore for Robotnik's use. Robotnik is pleased to hear about the ore, ignoring Crocbot's uprising, abruptly ending the transmission. He goes on to detail his plan with the ore; to power the Ultimate Annihilator that will completely destroy Knothole. He laughs manically as he looks at a viewer showing Knothole. Meanwhile, back at Knothole, Tails and Rotor have been brought back to the surface for roboticization. Thinking that their lives are over, they hear something coming from above. Everybody looks up to see an airplane, followed by Sonic, Knuckles and Geoffrey charging down from the sky. Rotor is surprised to see all three of them working together, but this gives Tails the confidence to call out to everybody to band together. Drago orders the SWATbots to fire, but fail, as the trio take them down easily, along with numerous combots in the area. Tails, Rotor and Sonic then focus their attention on the roboticizer, destroying it and freeing the Knothole Mobians. After freeing the Mobians, Sonic looks over to Drago, who he instantly knows is the one who perpetrated his framing. He tries to escape, but Sonic enters into a spindash, chasing him down. He runs and runs, but Sonic is able to quickly catch up to him. Before he can do anything Drago finds Hershy, which makes him lower his guard and beats the crap outta him then throws a rock, knocking him out. Sonic looks over to see Hershey the Cat, who stands over Drago in anger, claiming it was payback for making her kill Princess Sally. She explains to Sonic how she was tricked by Drago using Robotnik's technology, thinking she was cutting Snively off the rope, and not the Princess. She breaks down in tears, sorry for putting Sonic through everything, but Sonic has something else on his mind. He makes a fist and walks off to take care of some more business. Robotnik wakes up from another slumber, quickly updated by a SWATbot who alerts him that the shipment of ore from Downunda has arrived, but also report that Sonic has liberated Knothole. This news doesn't dissuade Robotnik however, with the Ultimate Annihilator, he thinks Sonic is nothing to him now. Entering the cargo bay of his base, Robotnik orders his SWATbots to let Sonic come, as he'll take care of the hedgehog himself. Unknown to Robotnik, Antoine and Bunnie, having escaped Downunda with the help of Walt Wallabee and Barby Koala, hide in the rafters of the bay. Watching Robotnik's plan unfold, they can't believe the scope of his plan, while the dictator enters his command center. He sits down, while Snively reports that Sonic has arrived in Robotropolis and is approaching the base. As he gets closer, defencive missiles launch from the base. Using his speed, Sonic creates after-images of himself, tricking the missiles and giving him free entry to the base. Sonic slams into the door of the base, easily entering, but is eventually stopped by Snively in mecha gear. He launches many wires at Sonic, tangling him with them. Although intent on not letting Sonic any further into the base with his mecha suit and his SWATbots, Sonic is determined to continue. He eventually untangles himself from the numerous wires and takes down the guarding SWATbots. He then turns his attention to Snively, giving him a swift kick to the stomach. He falls back, falling into a garbage chute in the nearby wall. With Snively out of the way, he continues along the corridor further into the base, until Bunnie and Antoine literally fall in, landing on top of him. Antoine and Bunnie quickly recover, alerting Sonic about Robotnik's Ultimate Annihilator and the bomb they planted to destroy Robotnik's war room. Sonic orders them to leave while he has a score to settle, but Bunnie is reluctant to do so. She grabs his arm, but he doesn't listen to the two, telling them to leave him be. Without any humorous words or behaviour, Sonic runs through the base, taking out any SWATbots in his way. He eventually makes it to the war room, seeing Robotnik in his command chair. He orders Robotnik to turn around and face him, which he does unrelentingly, firing lasers at Sonic from his robotic arm. Sonic uses his speed to avoid the blasts, but Robotnik notes that the small war room will hinder the full extent of his speed. Surely enough, this is true, as Robotnik is able to whack Sonic which his arm. As Sonic recovers, Robotnik presses a button on his command chair, activating the Ultimate Annihilator. Firing it at Knothole destroying it as it malfunctions. Despite knowing that the room will be destroyed at any time, the rivalry between the two makes them feel they have nothing to lose. Now, with all their anger, they focus their energies on each other. They exchange some of the most powerful punches that either have released, but despite the hits, their adrenaline keeps them going. Robotnik eventually takes command of the situation, using the shield from his robotic arm to deflect Sonic's attacks, then using the laser to attack. The laser misses, giving Sonic the opportunity to hit the doctor's arm. Suddenly, with the two rivals at each other's throats, the Ultimate Annihilator activates, engulfing the entire world into its glow, sucking all into oblivion. Some time later, Sonic is brought back to Knothole, in the medical facility under the care of Doctor Quack and Rotor. He slowly wakes up, but is quick to notice that Doctor Quack is still alive, thinking that the Ultimate Annihilator had destroyed everybody. He and Rotor reassure him that everybody is fine, and that, although the Ultimate Annihilator fired, they survived. Doctor Quack continues on, stating that everything that had occurred was his fault. He explains that the Dream Watcher he created earlier to help save the King had a neutron chip that was tracked down by Robotnik, also allowing him to learn that the King had returned. He further goes on to state that, while he and the other Freedom Fighters went to the Floating Island to get the Sword of Acorns, Robotnik sent out Snively and some SWATbots to get him and the King, who he replaced with a duplicate. Doctor Quack was brought before Robotnik, where he was told of his plan with the Ultimate Annihilator. He refused to help him at first, but when it was shown that Robotnik had imprisoned his family, he was forced to concede. At that same time, to prevent Sonic from ruining anything, he appealed to Drago to frame him. However, while working on the weapon, Doctor Quack noticed that Snively had plans of his own. Snively had secretly altered the Ultimate Annihilator to target one lifeform upon activation: Dr. Robotnik. Knowing that the weapon would only target Robotnik, Doctor Quack decided to stay quiet, hoping the weapon would do the job, and it did, destroying the doctor for good. Although this solves the mystery of the weapon, Sonic is curious about Sally. The doctor explains that she nearly died from the fall, but he had to disguise her death due to Robotnik's plans. He placed her in a stasis tube designed as a memorial to help her heal over time. Sonic is relieved to hear that she is still alive, but Doctor Quack tells him that she's in a coma, and that he has no idea when she will come out of it. Sonic is quick to get out of the bed, dashing out of the room and past all the other Freedom Fighters, leaving them wondering where he is running off to. He arrives outside to the stasis tube, which looks like a see-through coffin. He walks up to the tube and opens the lid, confessing his love for Sally and giving her a kiss on the cheek. He looks over her for a minute, when, all-of-a-sudden, she slowly wakes up, asking Sonic what he said. She gets up out of the tube, hugging him, while he says that he is happy to have her back. Doctor Quack was exonerated for what he did, continuing to take care of King Acorn, who is still crystallized. The Quack family was freed. Hershey the Cat was forgiven. The Freedom Fighters celebrated Sonic's return with wide arms and are planning a celebration. Geoffrey returned to his position of Commander of His Majesty's Secret Service. Drago was sentenced to life in the Devil's Gulag. With Snively...that will be found out later on. This version is considered canon. The comic actually shows the freedom fighters escaping Downunda. This version concludes Robotnik's relation with the Overlanders. The hastily put together fight scene was replaced with a panel where the ultimate annihilator fires at Knothole. An extra panel in pencil was added after the light consumes Sonic and Robotnik.